The Masonic oath is a psycho-dramatic representation aimed at ‘impressing’ the neophyte’s mind. But there is nothing religious about this oath. The presence of the Bible is purely symbolical. Furthermore, it is wrong to consider it as a Catholic book. The Masonic oath is a psycho-dramatic representation aimed at ‘impressing' the neophyte's mind. But there is nothing religious about this oath. The presence of the Bible is purely symbolical. Furthermore, it is wrong to consider it as a Catholic book. The Books that make the Old Testament, such as the Talmud, the Torah and the Pentateuch, are a collection of Hebrew scriptures. It would be more correct to say that the Catholic Church adopted them, since Jesus was an orthodox preacher of the Hebrew religion ( ‘I don't come to take away, but to add'). The books that can be considered Christian are the Gospels in the New Testament. But perhaps for the Freemasons of Catholic descent the Bible was the most suitable object to consecrate their rites. Indeed, it wasn't the same for everyone; French Masons, who belonged to an Illuministic culture, never adopted it. Nevertheless, here as well we have the confirmation of how Church and Freemasonry share the use of the ‘Hebrew sacredness', from which both have borrowed profusely. If we tried to enumerate all the symbols taken from a culture without giving any respect to it, the list would be endless. Together with the Bible, on the Masonic Altar we can find the Menorah (see The Lighting of the Menorah) , a seven-branched candelabrum sacred to the Hebrew religion, which represents the sensitive Universe (the nine-branched candelabrum is the Channukah). A good observer, though, can't help noticing that the altars in Churches have the shape of a Menorah. They have three candles on each side and in the middle, instead of the Hebrew hexagram, there is a cross. In total there are Seven lights like in the Menorah. The important detail is not to evaluate the lawfulness of using a symbol that belongs to others but rather the ability to keep its purposes as well as its meaning; the sun, for example, is a ‘pagan' symbol and it is one of the most used in the rituals of both Institutions. 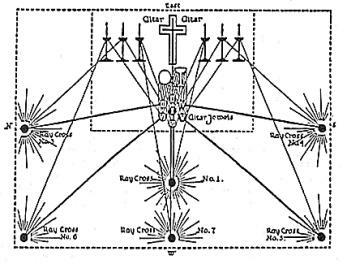 The Seven Lights have the purpose to irradiate a particular superior energy on as many initiates, using them to create a crown or aureole to fill the ritual space with spiritual energy. I am not sure if this happens in the Church. I doubt, though, that Masons have the faintest idea of what should be done during the ceremonial. A nice metaphor says that the sacred Book is a reflecting surface, where the Initiate looks at himself and understands that he is the symbol of the Great work. But man needs to be reflected in a ‘ Supreme Being ' who, through his presence, helps him to comply with certain rules that he wouldn't be strong enough to follow by himself. Each race has a sacred Book that holds the rules given by God. The Books are all different as different are the rules given by God. But each of them deserves the same respect, since they represent the effort of man towards a spirituality that in the material dimension is totally unconceivable. Nevertheless there is a reprehensible point in this reasoning. Many religions keep the habit of feeding on God. In ancient times this ritual was called ‘totemic banquet' (see The Exoteric path and totemic religions); today it is the ‘Sacrament of Communion'. The initiate shouldn't to get rid of symbols, but of the forms of tribal religiosity.